The Presidential Award for Civic Life was established in 1999 by then-President John DiBiaggio. 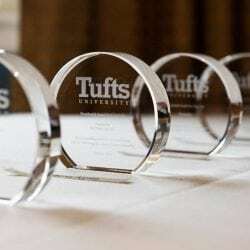 Each year this award recognizes undergraduate and graduate students from across Tufts University for outstanding achievement in community service and community leadership. Each winter, the President solicits nominations for the award from faculty and administrative leaders across the university. Students from any undergraduate major and all of the university’s graduate and professional schools are eligible for nomination. Winners are announced in late spring and receive their awards at a celebratory breakfast hosted by the President shortly before the end of the academic year. The Presidential Award for Civic Life is coordinated by the Jonathan M. Tisch College of Civic Life.